The brief was to design a small home that would be low maintenance, easy to live in and fulfil highly sustainable criteria. The House, which revolves round a light-filled central atrium for solar gain and light will be build with Tradical® Hemcrete® and feature eco-friendly service products including rainwater harvesting, ground source heat pumps, photovoltaics and low energy lighting. 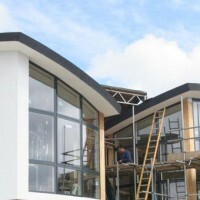 Together with high performance windows, doors and roofing, it will create a zero carbon footprint house. The curvature of these walls were achieved with lighweight shuttering and casting Tradical® Hemcrete® onto a timber frame. The lime render finish provides the ideal breathable surface for the high thermal performance of Tradical® Hemcrete®. This helps to provide a thermally efficient home from which to enjoy the open southern aspect of this site that provides stunning views through the high performance glazing.